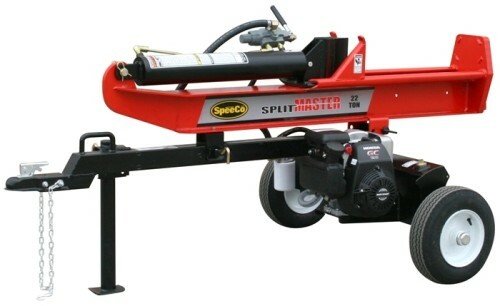 SpeeCo's LS622PH 22 Ton log splitter is equipped with a Honda GC 190 engine to deliver maximum splitting force. A global leader in log splitting technology, SpeeCo offers the best features in the industry, making splitting wood quicker, easier and safer! This item is drop shipped from the manufacturer and can take 2-3 weeks to process and 3-5 days to ship. The splitter arrived safely sooner than promised. Had my sons assemble it for me with no problems. Started on the forth or fifth pull. Had huge stacks of 2ft diam cut wood that I could not hand split so I caved and bought the splitter, which went through the stacks without hesitation. I recommend the Speeco 22T splitter and Omni Mfg. The price is way lower than local dealers. The splitter arrived in a broken crate with a dented oil filter on the splitter, and oil on 50% of the machine. Oil was from hydraulic lines,"taken apart for shipping". The broken crate and dented oil filter was from poor shippers. After assembling the unit and filling with gas and hydraulic oil...motor had oil in it, it started after 3or4 pulls. Ran like a top for aprox 6hrs then quit and could not get to start again, finnaly tracked the problem down to a little vacume hose on the back side of the motor under the fule line. The hose is very short and bent at a very sharp 90, it had split on one end and I was lucky to have found it because it had split on the back of the hose, you can't see it but you can feel it. Once I replaced it with a hose 12" long bent in a long loop the motor again starts with 1 pull" just like a Honda should" I have tried to contact Honda to point out this flaw, but no responce....Hope this helps somebody.